So your baby has finally arrived and you’ve taken tons of photos on your cell phone – but they just aren’t cutting it. It dawns on you! This is a once and a lifetime moments, she will never be this small again. Oh gosh! Will I find a photographer this last minute?! 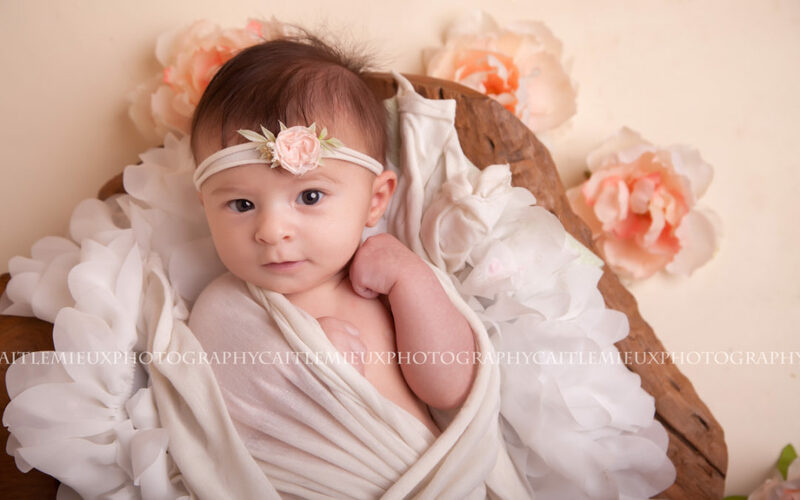 While it is ideal to book your session prior to giving birth beautiful images can still be captured but for the following reasons, it is ideal to see baby in the first 2 weeks of life. 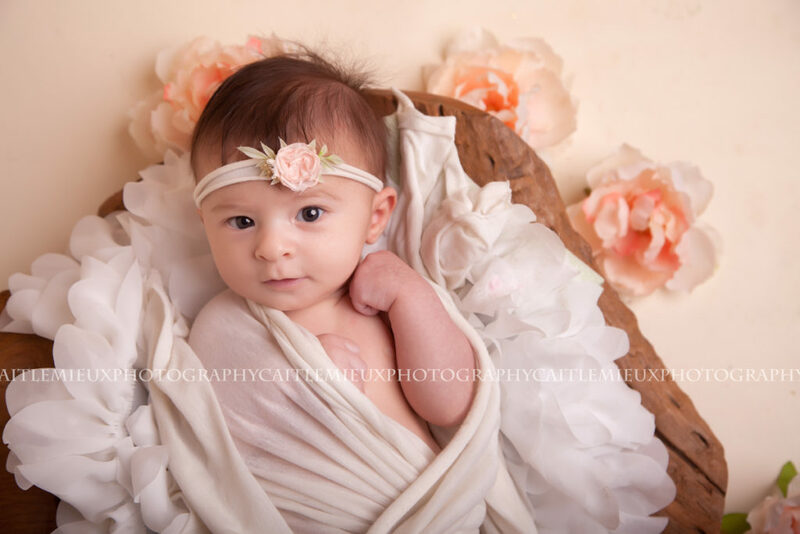 We got very lucky with this adorable little girls session! She was just shy of 2 months – so not so newborn anymore, but was tiny so we were still able to get her posed and luckily she gave us some smiles! Her mum was determined to get some shots as close to newborn as possible to we booked and crossed our fingers! As I mentioned to her mum, there’s no telling how the session will go… at this age I can’t guarantee a sleepy baby! Plus we are limited in positioning since they cannot stay on the tummy for long nor will they fall asleep for the session. Obviously no sitting either. All went well and we managed 3 different setups! However, I suggest getting babies into the studio within 6-10 days of life and ideally before 2 weeks. During this time babies are still sleepy and don’t mind getting curled up and posed into all the adorable positions. After this point babies are more alert and attached to mum and therefore aren’t fans of being posed 4-5 times within a few hours. Growth spurts around 3 weeks make for a very hungry (sometimes grumpy baby) and at the same time it’s common to develop baby acne . For all these reasons I suggest you book early to avoid missing these precious once in a lifetime moments. Welcome!! 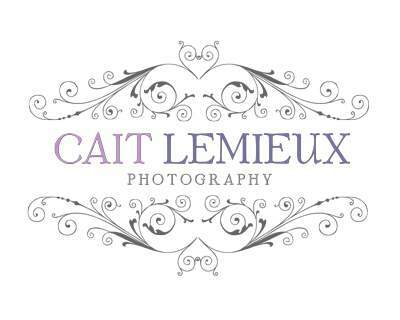 My name is Caitlin and I am a montreal-based photographer, specializing in newborn, maternity and family portraits. 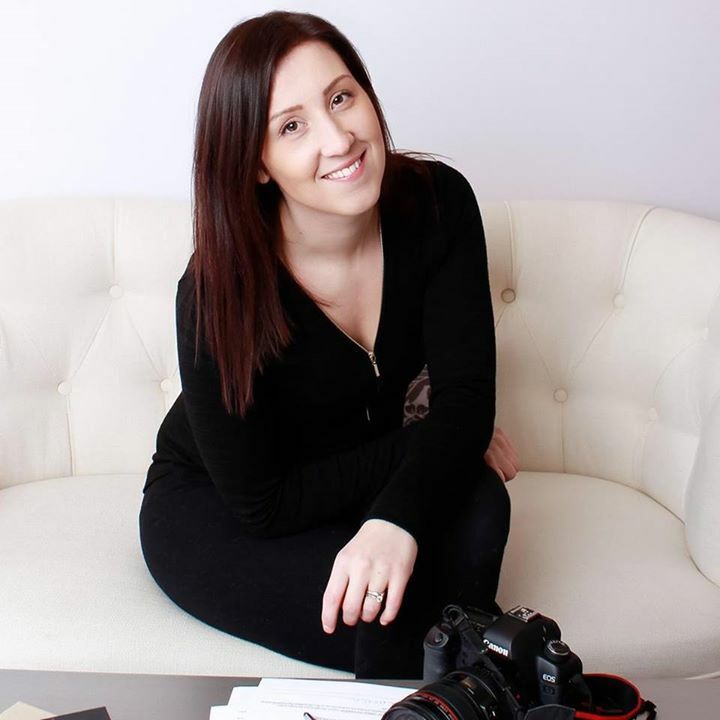 Cait Lemieux is a montreal-based photographer, specializing in newborn, maternity and family portraits. Her loving nature and attention to detail are a perfect combination for capturing your memories.